More than eight-in-ten U.S. adults now get news on a mobile device (85%), compared with 72% just a year ago and slightly more than half in 2013 (54%). And the recent surge has come from older people: Roughly two-thirds of Americans ages 65 and older now get news on a mobile device (67%), a 24-percentage-point increase over the past year and about three times the share of four years ago, when less than a quarter of those 65 and older got news on mobile (22%). The strong growth carries through to those in the next-highest age bracket. 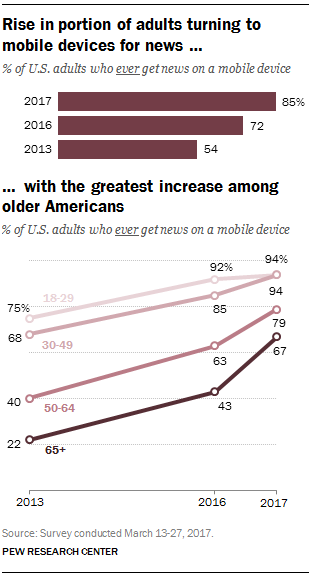 Among 50- to 64-year-olds, 79% now get news on mobile, nearly double the share in 2013. The growth rate was much less steep – or nonexistent – for those younger than 50. Heightened adoption of mobile devices for news among older adults is due in part to the fact that they had considerably more room to grow than younger adults. Mobile news use, like internet use and mobile ownership in general, was already very high among younger adults, leaving little room for growth compared with older adults. For example, 94% of both those ages 18 to 29 and 30 to 49 get news on mobile – unchanged since 2016 for 18- to 29-year-olds and only a 9-point rise for the 30-49 group. By contrast, among those ages 50 to 64 and those 65 and older, increases of 16 and 24 points respectively in the past year have resulted in majorities in every age group now getting news on mobile. A recent Pew Research Center report similarly found a sharp rise in overall technology adoption among older Americans. Even though a large number of older adults are getting news on mobile devices, that doesn’t mean they prefer it. 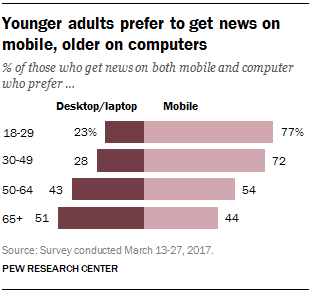 Across all adults, a clear majority of those who get news on both mobile devices and desktop/laptop computers prefer to get their news on mobile (65%). But those 65 and older are the only age group in which less than half prefer to do so: Only 44% prefer mobile, compared with about three-quarters of those 18 to 29 (77%), figures that have remained steady for both groups over the past year. In the next-highest age group, those 50 to 64, about half now prefer to get their news on mobile (54%), up from about four-in-ten (41%) a year ago. Large increases in mobile news use have also occurred among those with lower household incomes. About eight-in-ten adults with household incomes below $30,000 (79%) get news on mobile, double the portion of those who did so four years ago (37%). 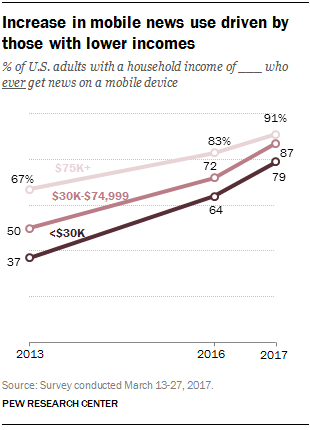 Even so, this is still lower than those with higher household incomes: About nine-in-ten of those with household incomes of $30,000 or more now get news on a mobile device. The other major digital platform for news is the desktop or laptop computer. Here, the 85% of all adults who ever get news on a computer is about the same portion that did so in 2013 (82%), with small or no significant changes by age or income from 2013 levels.